Counties covered by SWCAHEC include: Archuleta, Dolores, Hinsdale, La Plata, Montezuma, Ouray, San Juan, and San Miguel. The Medical Assistant Registered Apprenticeship Program is a postsecondary education and training program. Apprentices will receive at least one year of on-the-job training plus 150 hours of online learning with a journey-worker (preceptor) for a competency-based program. Apprentices become employees of the clinical practice and wage progressions are tied to skills attainment. Once the apprentice completes the program, s/he will be eligible to sit for a national certification exam. For details on the program, contact Russelyn Connor at 970-426-4285 or Russelyn.connor@swcahec.org. Employers may apply at any time. SWCAHEC staff are fully trained through the Spring Institute for Intercultural Learning in the delivery of Cultural Competency & Diversity Workshops. The Colorado AHECs are developing a statewide program to utilize AmeriCorps members in assisting local communities to strengthen community-based efforts and address the opioid epidemic in partnership with the Colorado Consortium for Prescription Drug Abuse Prevention, Rise Above Colorado and the Colorado Substance Abuse Trend and Response Task Force. The Community Opioid Response Program (CORP) program will be responsible for 12 AmeriCorps members who will provide support to local communities that are implementing strategies to reduce the impact of opioid abuse throughout Colorado. Members will coordinate and facilitate provider education events around safe prescribing practices, facilitate community educational events around safe storage and disposal of medications, and coordinate delivery of youth-focused opioid-related educational programming and resources. Members may also disseminate related messaging campaigns and initiate, support and enhance community-based collaborations. Those interested should apply at http://tinyurl.com/ACCORP2017. Only online applications will be accepted. ECHO is a statewide program of training and practice support to increase the capacity to manage complex health care problems in primary care settings and to prevent disease in Colorado. ECHO Colorado engages specialists, generalists, and many different organizations in learning collaboratives in which specialty healthcare and population health knowledge can be imparted and skills for the care of complex chronic health conditions can be improved. Learn more on their website by clicking HERE. SWCAHEC also facilitates access to University-based lectures and continuing education opportunities and is able to facilitate obtaining CME credit opportunities and web-streaming, live links, or archived links. Contact us for more information. Click on the ECHO Colorado video for virtual training and education for health providers. Through fiscal sponsorship, SWCAHEC can advance the goals of improving community health as well as the mission of our organization and to facilitate “doing more with less” by partnering with other organizations whose mission aligns with ours. Together, we can improve the health and wellness of the community through collaboration, provision of educational and outreach opportunities, and the sharing of tight resources. Learn more here. 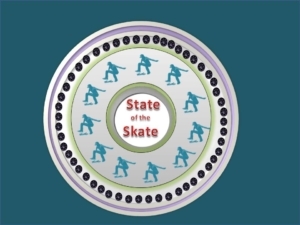 ~State of the Skate is a group of committed people – families, local businesses and organizations working together to improve the conditions and atmosphere of the skatepark by adding amenities, hosting competitions and ensuring on-going stewardship. Blueprints of Hope– www.blueprintsofhope.org ~Blueprints of Hope is a healing nest that provides compassionate, hope-filled solutions for all who face a cancer journey –patients, caregivers, families, cancer survivors, friends, and providers.